Prada Sunglasses, Highest quality prescription Rx - Eyeglasses.com since 1999. The Prada sunglasses brand remains the most adored brand across the globe. It has attained global recognition in a relatively short span of time, with its array of designer range of sunglasses exclusively designed for the ardent fashion lovers. Prada has its origin in Italy - the land of elite couture and the fashionista. Being one of the most popular brands in sunglasses, Prada's range of sunglasses affords you the comfort as well as the exclusivity in style. 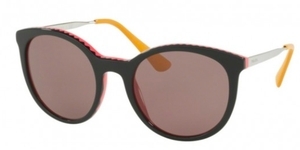 Prada range of sunglasses is available for both men and women. Wearing any of its designs is sure to render a strong character to your personality. The best part of owning this high-end brand is that it can be worn for all occasions. You can choose wearing a Prada for a casual as well as formal occasion. You can own your Prada eye gear without any doubts or hesitation, wherein this exclusive brand not only ensures the best style to suit your personality, but also confirms the much-needed standards required for one's eye protection.